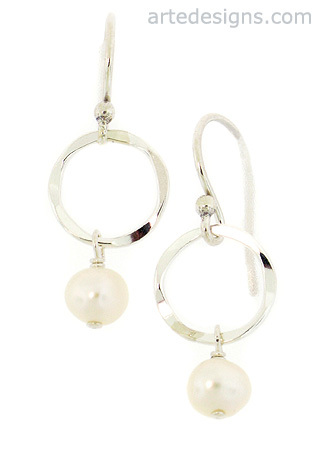 Hammered sterling silver circles add interest to these luminous natural pearls, creating a very elegant pair of earrings that will never go out of style. Pearl is an emblem of purity. It symbolizes love and happiness. Perfect for brides and bridesmaids. Just over 1 inch long. Sterling silver wires.